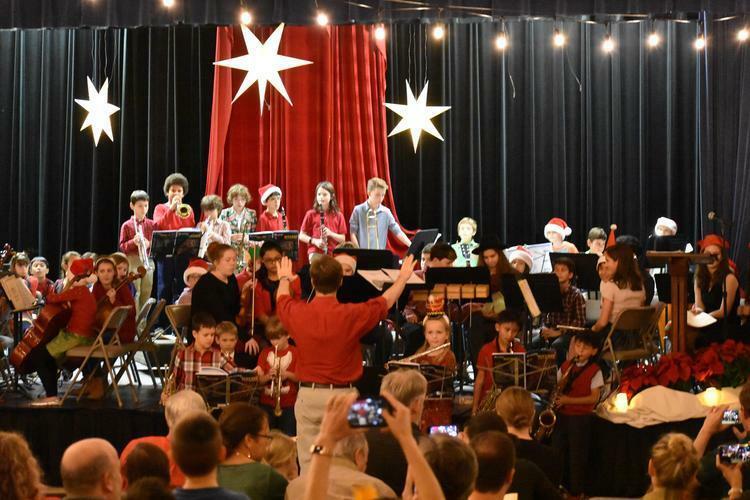 It was a wonderful event that included the Upper Elementary students singing “Ukrainian Bell Carol” and the Lower Elementary singers performing a robust and hearty version of “You’re a Mean One, Mr. Grinch!” The Ensemble performed jazz favorite “Sing, Sing, Sing” and “Sugar Plum Samba,” and featured many soloists in “Jingle Bell Rock” – including SCM parent Leo Costello on the electric guitar! The Orchestra performed “Away in the Manager” and “Good King Wenceslas,” the Intermediate Band and Ensemble performed crowd favorite “Wooly Bully,” and our new musicians in the Beginning Band played “Au Claire de la Lune.” The evening ended with the traditional “A Festival of Nine Lessons and Carols,” which was performed by the Ensemble, narrated by AC Students, and sung by all of the SCM families in attendance! This was a wonderful way to begin the Advent season! Click here to view more photos from the Christmas Concert.